This week, we’re taking a look at the barbarians that populate Erehwon’s frozen north. 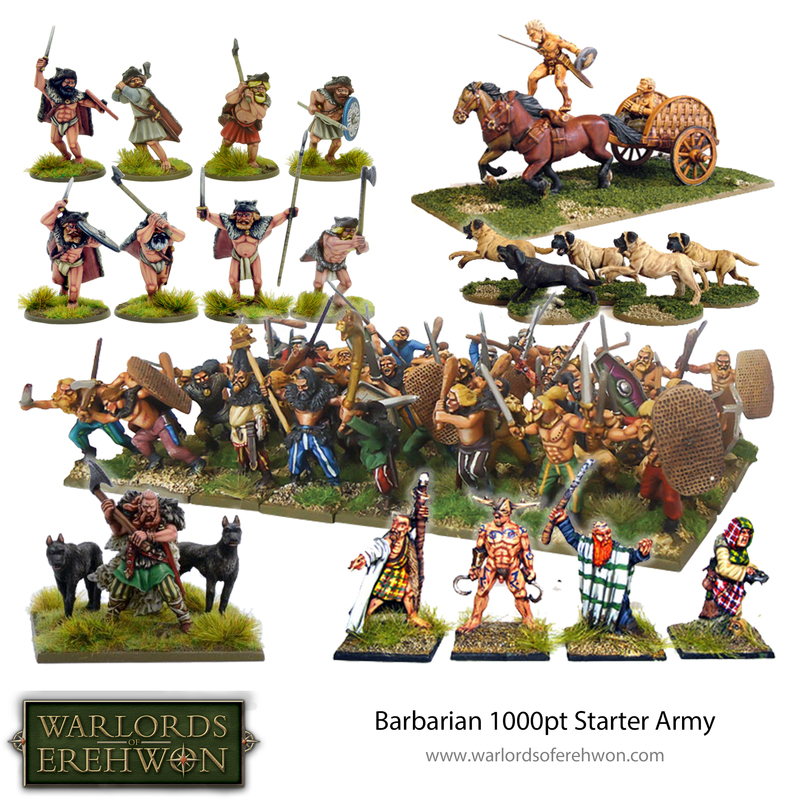 Grab our Barbarian Starter Army and get stuck in! The Barbarians list represents a whole range of wild and savage warbands from hulking Neanderthal warriors of the Ice Age astride bellowing mammoths, hairy Norse raiders accompanied by fearless berserkers, and the proud Fianna of Celtic legend with their chariot-riding heroes. Our list is highly adaptable and can be used to create warbands from a wide variety of historical cultures as well as the mythic past. It is also an ideal way of building a force inspired by the pages of classic Sword & Sorcery fiction and – of course – the movies and model range inspired by them. 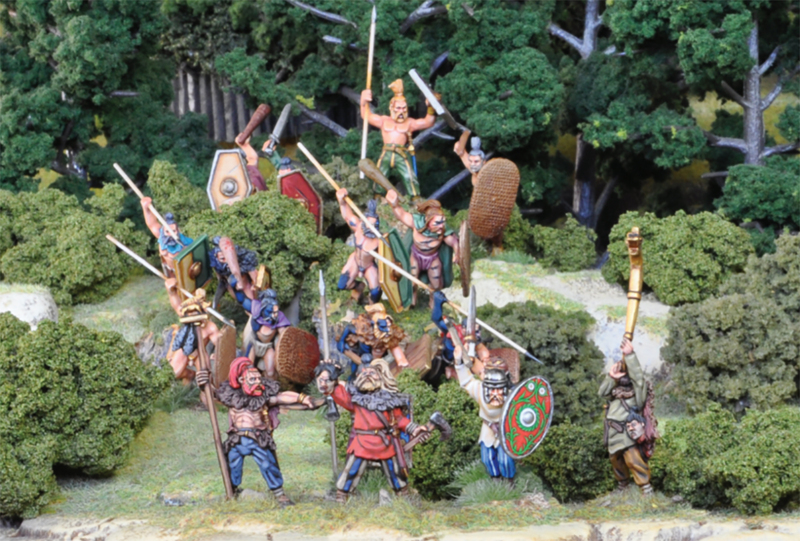 A Barbarian Warband emerges from the spring forests! Barbarians are naturally superstitious and behold the spirit world with an appropriate mix of awe and terror. These are dangerous opponents and, like most barbarian warriors, they like to keep a big axe or huge sword handy. Ordinary barbaric warriors will sometimes settle for a spear and may even be found waving a bow, but on the whole, they prefer to get stuck in despite their generally low levels of armour. They are careful to placate the gods of sky, earth, wind and water, but they expect nothing of the gods by way of favour. Their wizards are represented by shamans, possibly marked with the skin of a totemic beast, a headdress made from the skull of an animal, or some other token of their spirit guide. Woad-painted Barbarians form a skirmish line ahead of the main force! Some barbarian forces are accompanied by swarms of malicious urchins armed with rocks or slings – they can be annoyingly good shots too! Some barbarian forces are accompanied by swarms of malicious urchins armed with rocks or slings – they can be annoyingly good shots too! Others include crazed berserkers. Mounted troops are always an option although on the whole barbarians prefer to fight on foot. With a savage’s love of the hunt, they bring their warhounds to battle under the control of pack masters who lead them to their quarry. been included to provide some long-ranged brutality for those who crave it! 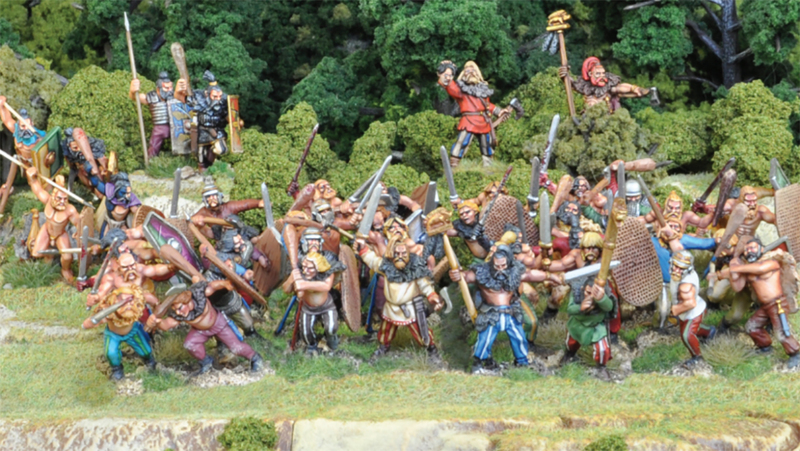 We’ve scoured our Hail Caesar range to put together this fantastic starter army for Warlords of Erehwon. The whole army bristles with ferocious rage, ready to slip its traces and charge into the fray, howling a bestial battle cry. The post Spotlight: Barbarians of Erehwon appeared first on Warlord Games.